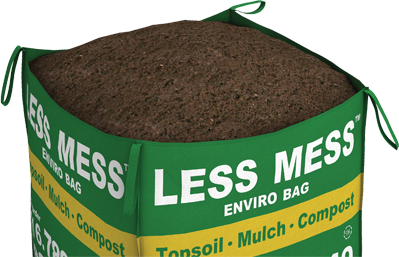 Less Mess topsoil is a nutrient-rich blend of soil that is excellent at promoting healthy plant growth. As the name implies, topsoil is the uppermost layer of soil and is a blend of decomposed organic materials, minerals, rocks, microorganisms, moisture and air. Without topsoil, it is difficult for your garden to flourish to its full potential. Topsoil aids in plant growth by providing essential nutrients, moisture and air, and offers an anchor for plant roots. It also helps your garden retain water and limits erosion while providing a home for decomposing organic nutrients. Of all soil varieties, topsoil is the most fertile and is extremely beneficial for new plant growth. 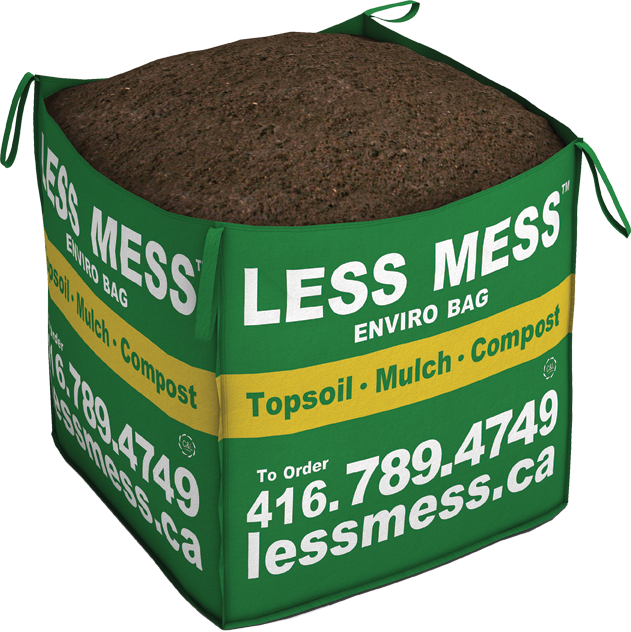 Less Mess is a custom Earthco blend of topsoil including compost and peat loam, processed through a 5/16” screen. Quality topsoil such as this will achieve the right nutrient mix, giving your garden the best opportunity to live, grow and thrive. The growth rate, health and visual appearance of your plants are directly related to soil quality. Quality topsoil is the ultimate foundation for creating new gardens, or reviving and replenishing existing garden areas. Trees, shrubs, flowers and garden vegetables all need topsoil. Topsoil is also ideal for growing new lawns from sod or seed. BENEFITS OF USING LESS MESS TOPSOIL.
. Spread at least one inch of topsoil on nutrient deficient soil and mix thoroughly.
. Spread topsoil 3” to 4” inches, seed, then moisten surface. In order for grass to germinate, ensure you rake the seeds into your lawn. Water frequently.
. Spread 3 – 4 inches of topsoil over fruit, vegetable and herb gardens to ensure bigger, healthier plants and larger fruits and vegetables.
. Fill in low or bare areas of your lawn with topsoil to encourage growth and prevent pooling of water.
. Mix dehydrated manure and topsoil together for healthier, hardier spring annuals.